Escape to our romantic 680 sq. feet of total log cabin. 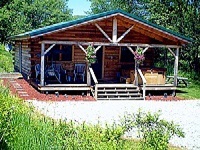 Secluded in the valley of our 70 acres in the heart of the hocking hills . Once you arrive you will find everything you will need . From the comfort for a 6 person hot tub to a fully equipped kitchen , a queen sized log bed from which you can watch the flames of the fireplace to the satellite tv / vcr or listen to romantic music on the stereo system. Located within minutes from all major activities . Rates $90.00 to $150.00 per night for 2 people plus tax . Winter rates $75.00 to $125.00 per night for 2 people plus tax. Holidays excluded . New secluded log cabin, located in the heart of Hocking Hills, hot tub getaway,670 sq.ft.,full kitchen and bath, ac, sat.tv, stereo, gas grill, sleeps 2 adults 2 children.